Iridescent chunky glitter makes this slime have a spectacular sparkle to it! It reminded us of fairy dust which is why we named it fairy slime. This would be perfect to make for a fairy party, afternoon activity or even just for the slime fan in your house. 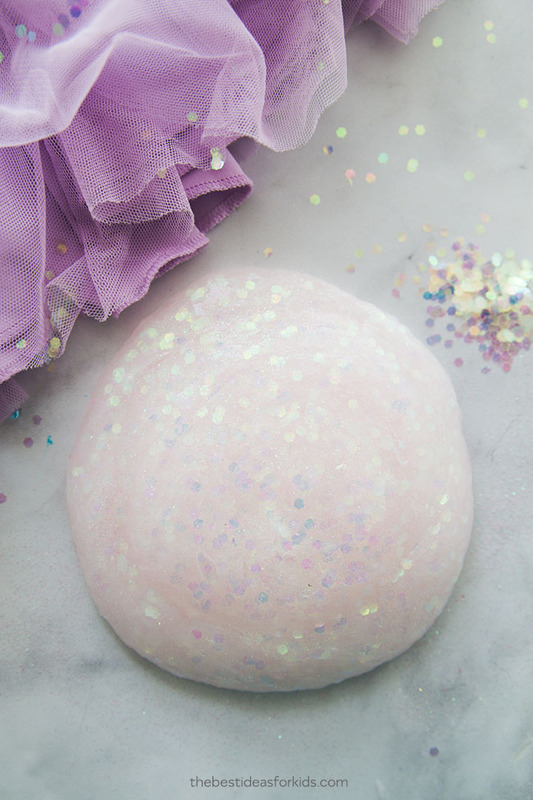 Kids will love helping to make this fairy slime. 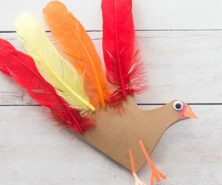 The best part about it is that it’s low mess too – no food coloring needed and the glitter won’t come off on your hands. We have a little confession about this slime. It was supposed to be a little more pink than how it turned out. When we think of fairies we think pink. So we intended for this to be an iridescent pink slime. But when we added the chunky iridescent glitter we just loved how it looked as is so we decided to keep it this color! This iridescent glitter reminds us of fairy dust. What do you think? If you’re a fan of Peter Pan you’ll know that the fairy dust from Tinker Bell is actually a gold color. 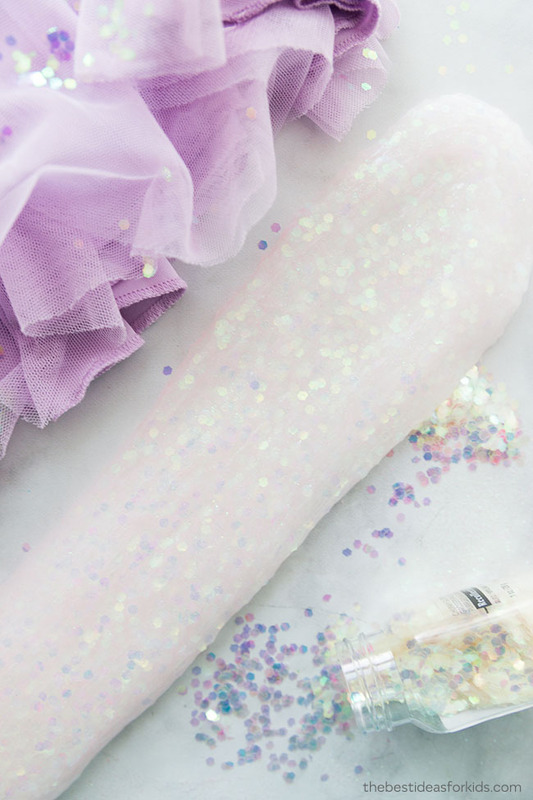 So you can get creative here and make any color fairy dust you’d like! Just swap out the chunky iridescent glitter for a gold chunky glitter and you can make Tinker Bell’s pixie dust instead. 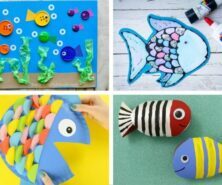 This slime is really easy to make and leaves little mess since you don’t have to use any food coloring. Slime is actually a polymer because it has qualities of both a solid and liquid. Other examples of polymers are Jell-O, gum and rubber bands. White glue is also an example of a polymer. A polymer is made of long chains of polyvinyl acetate molecules. These chains slide easily making the substance like glue easily pourable. When you add the contact lens solution to the glue, it counteracts the glue and forms a viscous substance of slime which can be shaped and pulled. This slime forms due to the glue molecules cross-linking with the borate ions. This is a bond that causes the large molecules to no longer slide freely past one another (like the substance was when it was a glue). Therefore resulting in the slime substance! Will This Slime Recipe Work? All of our slime recipes are easy to make and should turn out if you follow the instructions carefully. Do not substitute for other brands as your slime may not turn out. The type of contact lens solution we use is very important – this is what turns your glue into slime. We always recommend Elmer’s glue because it’s quality glue and creates the best slime. If you do not have Elmer’s glue in your country you can substitute the glue for another quality PVA glue. Safety tips: Adults only should make the slime and handle all chemicals. Do not substitute any ingredients in our slime recipes. If you have sensitive skin, wear gloves while playing with the slime. Always wash hands before and after use. If you notice any skin irritation discontinue use immediately. See the bottom of the post for more safety precautions before making your slime. 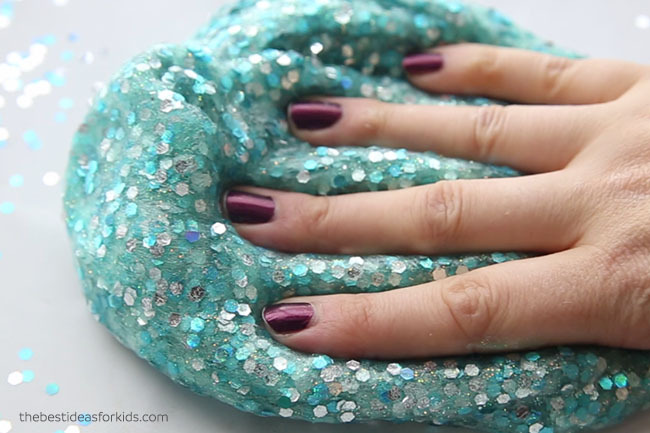 The other thing we love about this slime is that the glitter is chunky. This chunky glitter gives it more sparkle that you can notice and is smooth on your hands when playing with it. Unlike some glitter that can be sharp, this brand of glitter does not feel sharp. And the best part is it shouldn’t flake off on your hands. Biodegradable Glitter – we have had some requests for a biodegradable glitter option. We found this biodegradable chunky glitter from Etsy as an alternative. Note that this glitter will start to break down after a few weeks when exposed to any liquid. How Long Does The Slime Last? This slime recipe should last at least 1 week if stored properly. It will typically last much longer. Store in an air tight container or bag. We like to store in a resealable bag so we can press out all of the air from the bag. If you’re looking for a simple slime recipe, our base slime recipe can be found here: How to Make Slime With Contact Solution. We like to use contact lens solution instead of borax in our slime recipes. 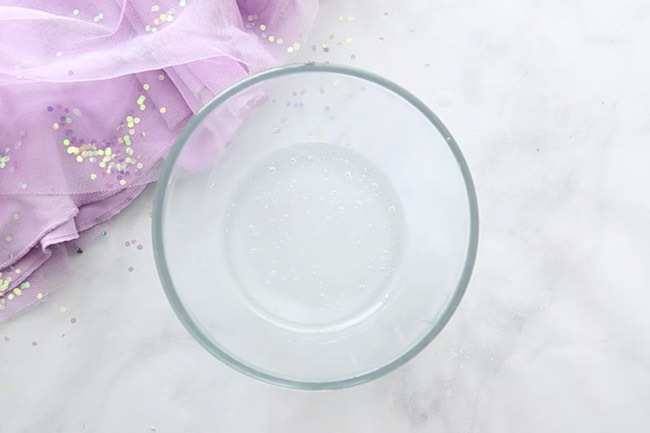 This basic recipe is what we used to make our fairy slime with some small tweaks. – Elmer’s Clear Glue (6 oz) Note: We have only tested this with Elmer’s glue and recommend this brand as other brands may not work. TIP: To save money we like to buy the gallon size of clear glue. – Chunky iridescent glitter. The glitter we used was called Glitz by Recollections from Michaels but you can actually get the exact same glitter from Darice here. – 1½ tablespoon of Contact lens solution. **Important: your brand of contact lens solution must contain boric acid and sodium borate. We like this brand the best and use it in all of our slime recipes. See our full contact solution slime recipe for the brands we recommend. Do not substitute for any other brands. 1. Get a bowl to mix your slime ingredients in and a small bowl for your water. 2. Add your 1/4 cup of warm water to a bowl. 3. Add 1/2 teaspoon of baking soda to the bowl of water and mix. Make sure the baking soda fully dissolves and the water becomes clear. 4. Add 6 oz of glue to your large bowl. Slowly add in your water mixture and stir very gently. TIP: To prevent the clear glue from making too many air bubbles and looking cloudy stir gently while making your slime. 5. Then add in your fine pink glitter and chunky iridescent glitter. We used a lot of the chunky glitter so that it covers the slime. You can find the same chunky glitter we used on Amazon here. 6. Slowly add in your contact lens solution. Add it in a teaspoon at a time and then continue to mix. Mix slowly to not over-mix and cause too many bubbles. Reminder: your contact lens solution should contain boric acid and sodium borate or your slime will not form. Once the slime starts to pull away from the bowl you can take the slime out and knead with your hands. It will still be sticky at this point and that is normal. Keep kneading for 5 minutes and the more you knead, the less sticky it should be. If you still find it sticky after kneading for 5 minutes we recommend trying to add some baby oil or lotion to your hands first. That way you can makes sure you don’t over-activate the slime. You can also add in more contact lens solution if you still find it too sticky. Only add an extra teaspoon at a time and continue to knead until you find a consistency you like. Now your slime is ready to play with! 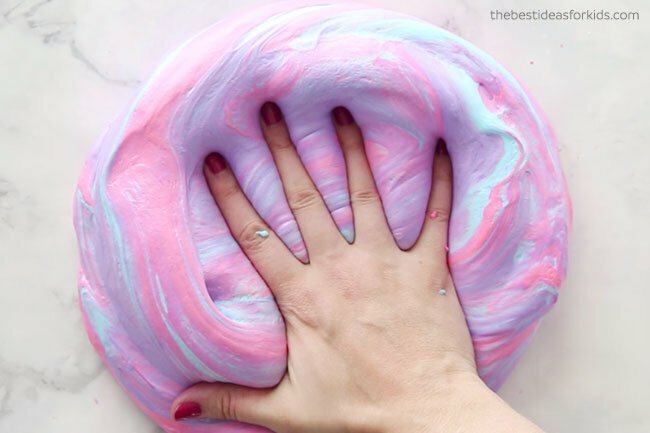 Kids will love stretching this fairy slime! Store your slime in an air tight container or bag and it will last at least one week. Note: Making slime is a science experiment and safety precautions should still be made when creating slime. By making this slime, you agree to our site terms which you can read here. Always read and follow the labels of products used. If contact lens solution is accidentally ingested, seek medical attention immediately. This project is not suitable for children under 4. Slime should not be placed in the mouth. Always wash hands before and after playing with the slime. If you notice any skin irritation, discontinue use immediately. If you have sensitive skin, wear gloves while making and playing with the slime. Slime is a science experiment and should be made and played with in moderation. Do not allow children to make their own slime and do not play with slime for an extended period of time. Have you tried fluffy slime yet? This is fun to make and the texture is actually “fluffy”! 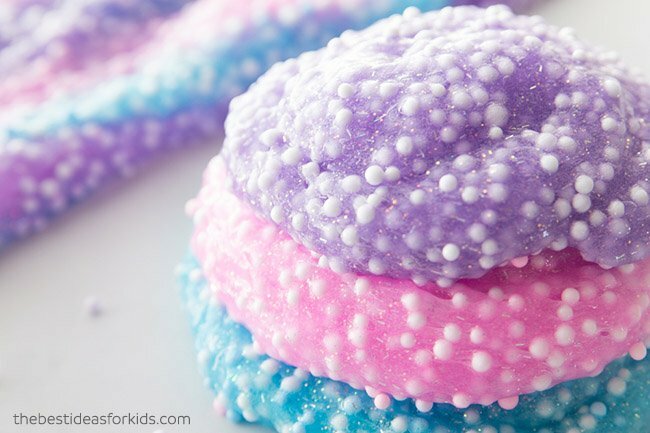 This mermaid slime is one of our favorites! 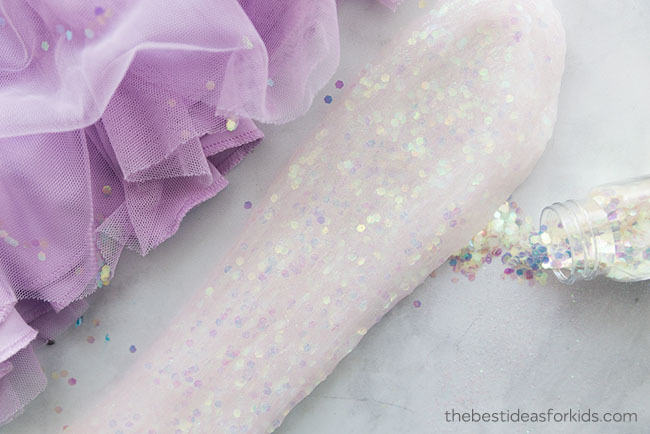 See how we made this slime that looks just like a mermaid’s tail. 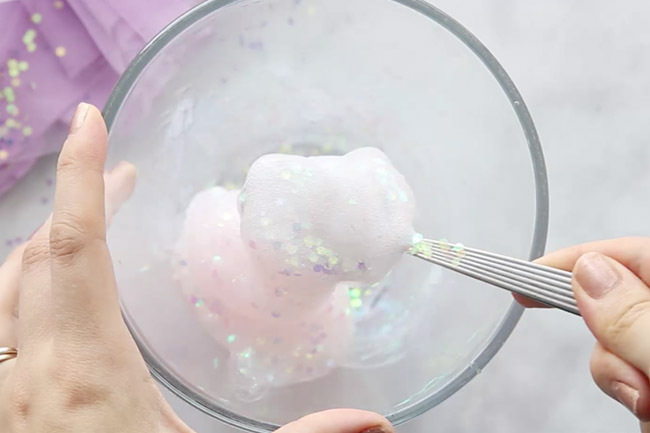 And see our unicorn floam recipe – easy to make and fun crunchy slime! Pin this image to save the recipe for later! 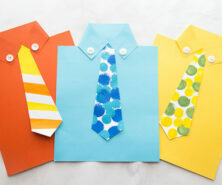 I want to make this with my daughter and her friends on Saturday for her birthday party (its a sleepover). I could only find 5oz bottles of clear glue. Will that affect the recipe? Should I alter it at all? Using only 5 oz would be fine! You’ll just need a little less contact solution so just add this in slowly and cut back a little than what it calls for so you don’t over-activate it (or it won’t be as stretchy).